One of Marco Pierre White's favourites' comfort food at its best. Preheat the oil in a large pot and add the onions, garlic and beef, cook until golden brown. Add the red wine and 1 L water. Bring to the boil, reduce heat and simmer until the meat is tender. 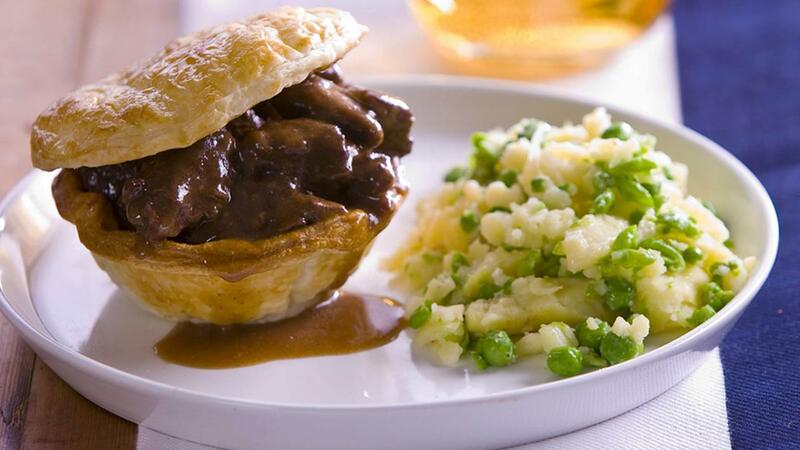 Create slurry with the KNORR Rich Brown Gravy and 100 ml hot water, stir into the cooked pie mix and continue to cook until thickened. Line the pie dishes with the puff pastry and add the pie mix. Place another piece of pastry on top and press down to seal the edges, bake the pie in a preheated oven (170 degree Celsius) until golden brown and cooked. Boil the potatoes until tender, drain and allow to "steam off". Boil the peas for 5 minutes, drain and add to the potato, roughly mash.